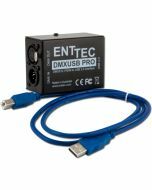 Connect your favorite supported control software to your lights with this next generation USB interface. Based on the original, but with a smaller footprint and more features. Newly designed electronics with a CPU 6 times faster than the original, guarantees no delays or drop outs even under heavy use. Two fully isolated DMX/RDM outputs or inputs can control up to 1024 channels. Optional MIDI In/Out connectors allow integration with show control systems, or MIDI keyboards & surfaces. Standalone mode allows you to store your light show inside the DMX USB Pro MK2 and play it back without connecting your PC.